Through software applications, coconut farmers will be able to test the soil and come up with algorithms which would be able to determine the best location to cultivate their crops. There is hope that this technology will be able to aid farmers in yielding more produce and expanding in the industry. CARDI will develop the apps in Trinidad and Tobago and then send to Caribbean countries for them to test. The original article posted by the Department of Public Information on July 12, 2018. 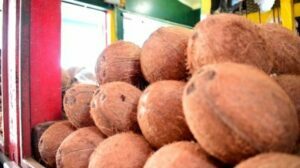 The Caribbean Agricultural Research and Development Institute (CARDI) is embarking on a new project which will transform the coconut industry across the Region. This is according to Information and Communications Technology (ICT) Infrastructure Specialist, Ria Jack. Augmented Reality is a technology which imposes a computer-generated image which is then projected on a user’s view resulting in a composite image. Through these software applications, coconut farmers will be able to “test the soil and come up with algorithms” which will be able to determine where would be the best location to cultivate their crops. Jack expressed her hope that augmented reality will aid coconut cultivators to yield more produce and expand the industry. This project was presented during the Augmented Reality – Coconut Industry workshop, today at the Caribbean Telecommunications Union ICT roadshow hosted at the Arthur Chung Conference Centre in Liliendaal, East Coast Demerara. The Department of Public Information (DPI) spoke to some of the participants of the workshop who expressed their views. Massiah said “it can also have some major impact” if it the technology can connect with live data analytics. This he said would allow farmers can have a better view of their plot along with the necessary data which will help them to maximize their productivity. Daniel Baldeo-Thorn also expressed his belief that the implementation of augmented reality will greatly benefit not only Guyana’s coconut industry but overall the entire agriculture sector. ← Is Guyana on its way to becoming the Caribbean’s new technology hub?